Kyrie Irving is one of the best basketball palyers in NBA and especially he is a good shooter. 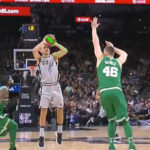 He won the NBA Three-Point Shootout in 2013, and he led the Boston Celtics got a amazing performance, 22 won 4 lost, Celtics now is still the No.1 of this NBA season. 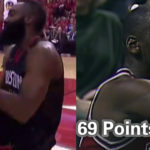 Why he can make so many achievements, the most important reason is his shooting form very scientific and rational. 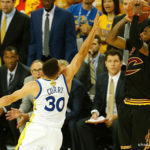 Kyrie Irving is the same leavel basketball palyer as Stephen Curry, also his shooting ability. 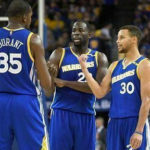 Their shooting forms have many similar tips, such as they are all low elbow shooter and they all shoot with adducent right elbow shooting form, they all shoot with two feet paralleled position and the two feet are not very far between each other, etc. 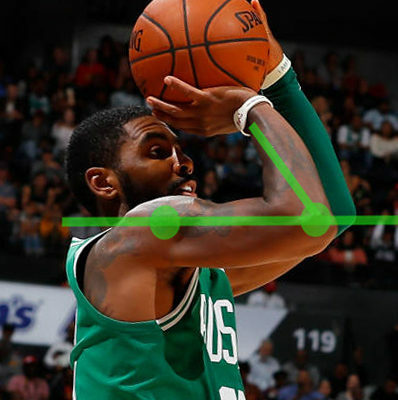 Today I will share you the Kyrie Irving’s shooting form set point analytics, the How To Shoot Like Kyrie Irving Series will be many articles, the set point analysis is the most important tip of them. 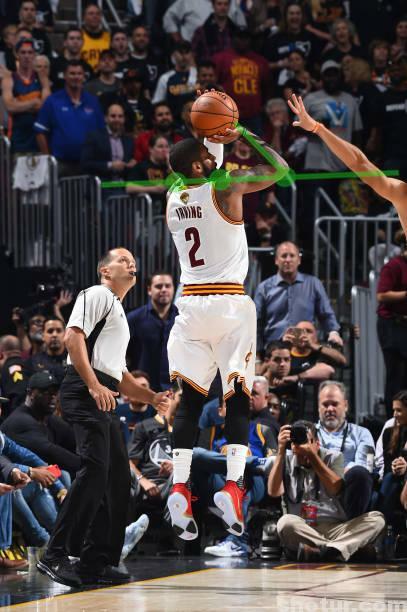 The other articles just about How to Vertical Jump with Kyrie Irving’s shooting form, How to Shoot Like Kyrie Irving with Medium Tough Hand, How to Catch the Ball with Kyrie Irving’s Shooting Form, and The Left Hand Position Analysis of Kyrie Irving’s Shooting Form. 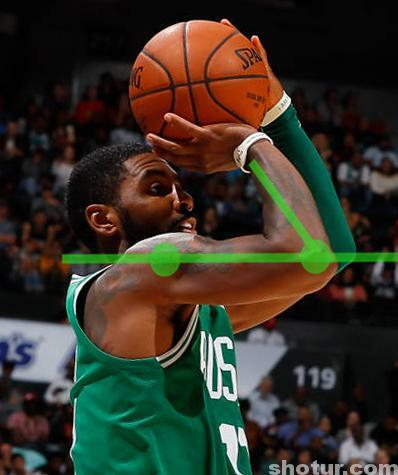 Now let us start Kyrie Irving’s Set Point Analytics. 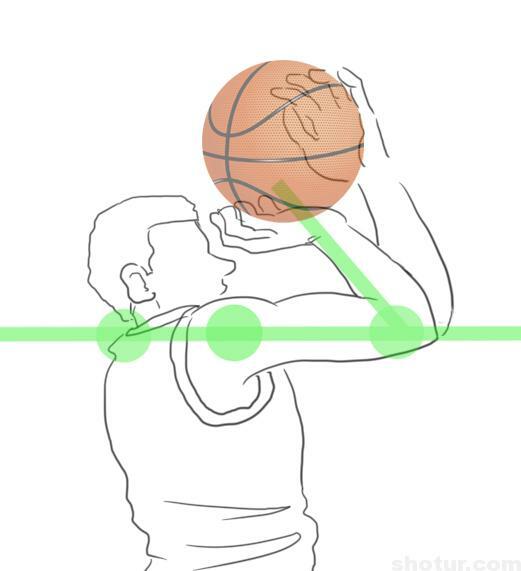 If you read my article carefully and you really know the meaning of my Straight Force Shooting Theory, you will know that our right elbow position is very important for our shooting ( for righty players, if you are lefty player, just imaging your left elbow corresponding position). 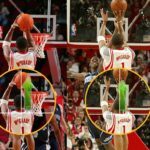 In the Straight Force Shooting Theory article, I have mentioned many times that a good shooting set point must with a low elbow position. 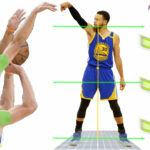 If your shooting set point with high elbow position, your shooting foundation will be unstable, your upper body will be easy to shake. 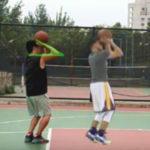 I have test more than 10 good set point shooting forms in the last 10 years, finally I found when our main arm at horizontal line or even a little low, we will find our shooting get more comfortable and easily. 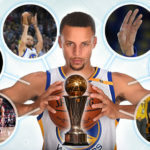 Such as Stephen Curry, Ray Allen, Reggie Miller, Michael Jordan, Kyrie Irving, Steve Nash, etc. 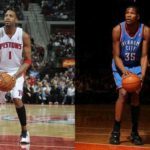 There are still many good shooters’ shooting with high elbow shooting form, such as Larry Bird, Allan Houston, Kobe Bryant, LeBron James, Rashard Lewis, etc. 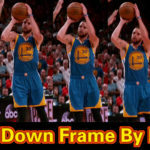 They are all can get high score in the NBA games and have a good shooting percentage, but if you compare them with the low elbow shooters shooting form, you will find the low elbow shooters shooting a little more stable. 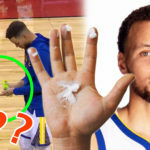 If you master the Soft Hand Shooting skill, you can easy to test the reason. 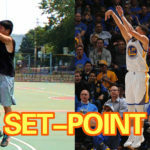 Just as the picture shows, when the set point posture looked at the right side, our two shoulders and elbows are at the same height, especially our right shoulder and our right elbow almost in a horizontal line. Our right shoulder blocked our chin, so in the picture we can not see our chin. 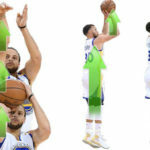 The right forearm is not vertical so you do not need use 3 90 degree theory in Irving’s shooting form, of course the same with Stephen Curry’s shooting form. 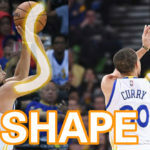 The intersection angle between main arm and forearm is very small, that will make you shoot a long three easily. 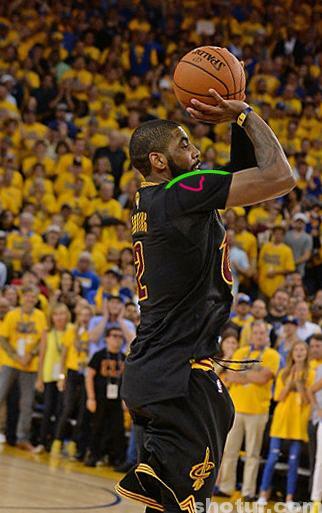 Kyrie Irving is a long shot player, in NBA nowadays, almost all good shooter’s right hands are not shooting with empty palm. 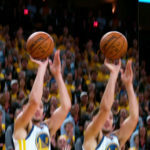 We all shoot with full hand force, this skill will make you ctach ball tight and use your most of power to shoot. 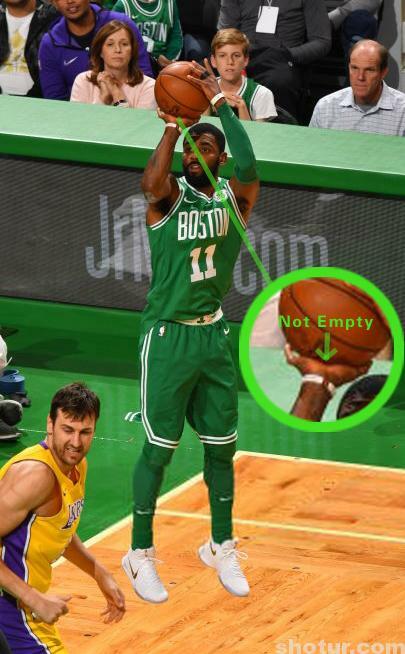 If you shoot with empty palm, you will waste some of your shooting force. 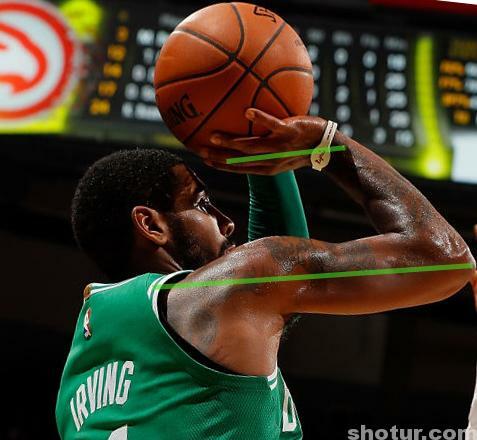 About Kyrie Irving’s shooting form, I just share these tips, of course there are still many tips for Kyrie’s shooting form, I will share them later on Youtube and Shotur.com, just subscribe my website and Youtube channel, do not miss the new infos. I want you to do an in depth analysis of Klay Thompson’s shooting. Kindly do the same and oblige.